And it not have the supernova-like intensity and power to reach your very core, of an interaction spanning a single day (Before Sunrise, Before Sunset, Before Midnight), or relatively brief moments in time and space (Doctor Who)? And yet even as you know that you can never take another breath without being conscious of the other, you wonder if they feel the same - if they passed you someday in the future, if they would even remember your face, your name - or if they would just have a flitting notion that you may be someone they might have known before. In relationship terms (albeit much more one-sided in their favor), Eleven Madison Park never has to worry about that. The 3-Michelin-Starred EMP has been on my bucket list for a long time. And on a recent trip to NYC, I was excited to finally get to experience it. It was going to be my biggest splurge of the trip - between my schedule and the more 'affordable' $175 menu (vs dinner at least - def still a meal I needed to save for!) - I decided to go for lunch on my final day in the city. I fell immediately for the elegant, yet approachable vaulted space flooded with beautiful natural light - formal, but the tables were set up in different sections that gave some privacy - such that you get the 3 star vibe, without being uncomfortable, especially when dining solo. An immediately intriguing envelope lay, loudly silent under a knife at the table when I arrived. Inside was a punch card: a sort of culinary 'Choose Your Own Adventure' start to the meal - offering four paths: cherry, strawberry, celery and coffee. I was to select the flavor that most appeals to me, and punch that symbol out. This chosen flavor would then influence elements of the dishes that were to come in the tasting menu: I'd been forewarned the meal would span three and a half hours. And there was still one more choice to make, for my entree: I chose duck. The first bite that arrived was a NY classic with a twist: Cheddar Black & White Cookie but made with with cheddar, apple and vegetable ash. The mixing of tradition with creativity, invoking of time and place (and reversal of it by serving an item typically associated with the end of a meal, as an amuse at the start), of sweet, savory and tart was a great preview of the care that would be put into the rest of the menu. Then a bit of delicate, palate-prepping elegance to balance the playfulness: Caviar, Creme Fraiche Baked Potato Ice Cream with garlic flowers and chives. Followed by a solitary, perfectly chilled Oyster with mignonette snow, buckwheat, sorrel. From ocean to earth, the first hot course was Morel Custard with Maine Sea Trout Roe: delicious, rich umami served piping hot from a hand crafted ceramic bowl. Every course seemed a carefully choreographed part of a masterpiece: earthy, rich smooth hot custard sprung gracefully into perfect English Peas warmed, brightened by meyer lemon gelee and shaved cured egg yolk. To ensure I was engaging with my food, the next course was a semi-DIY activity. Several platters were presented: on a wooden board was rye bread, with dots of mustard, pea puree, ramps. On a silver platter were beautiful cuts of Beef Pastrami. Your mission should you choose to accept it, is to finish the chef's thought and put the elements together to create a bite-sized open face pastrami sandwich. This was EMP's take on another NY staple - the deli sandwich - elevated. And it was the best pastrami I'd ever had: the texture of the meat was like wagyu filet. Then came the first element incorporating my chosen flavor: cherry soda. Housemade, fresh, and delicious with the pastrami on rye. Usually, rolls would arrive before your meal - but EMP serves theirs several courses in. And, they were one of the best rolls I've ever had - beautifully flaky, buttery, yet airy and served fresh out of the oven with two types of butter: cow milk with sea salt, and duck fat (the second type of butter is tied to your chosen main course). And, a food love story would be remiss without Foie Gras. I chose to have it seared, as this method best retains the lovely, rich, creamy, fatty texture than any other. EMP served this up with a fava bean horseradish marmalade, sorrels, and chopped lemon rind for acidity to cut through the fat. As another homage to the city that serves as home, and the storied salad that was invented there: there was the tableside, very entertaining preparation of Apple Waldorf salad with apple, celery, rhubarb, candied walnuts, lemon mayo, and Winnimere blue cheese. My server transformed into storyteller, taking us back to the legend of the invention of the dish. And the artisan-craftsmanship, with the hand cored and shredded apple helped transport us back in time. The final mix was served on a giant, very tall wooden bowl that just had a very shallow dip in the top to act as plate. At first, I just chalked this up to showmanship and another conceptual way to perhaps evoke the orchard in presentation. But a surprise actually lies below! When I finished with the salad, my server gave the top of the giant bowl a quick twist, and off came the top lid/plate to reveal gazpacho, using flavors from the preceding salad, and a spoonful of fun toppings for textural interest including spherified celery root, celery chip. From the 'fruits of the earth' course, we progressed to a 'fruits de mer' course of Lobster poached with beets, ginger and nasturtium. I would have liked the lobster to have a softer (though still structured) less robust texture, and more pronounced sweetness - and the 'sheets' of beets lost a bit of the pleasing quality of that tender crunch that makes it one of few vegetables of which I can be a fan. ...elevated by black truffle and potato puree. EMP understands that visuals are a critical part of the dining experience: every course presented reflected the care they put into letting the diner in to their cooking process, like the asparagus, or in the case of the entree: what your dish looked like before they plated. In this, a vision of beauty: herb and spice crusted honey rubbed lavender scented roasted Duck, presented in a copper pan. I devoured it whole first with my eyes, but alas stuffing it whole into my mouth was not in the cards for me. Before they brought the plated duck out, there was a little teaser snack, a bite that reminded me of asian shrimp chips, topped with a gelee and bonito. Thoughtfully weaving a coherent thread through the meal, the elegant sliver of duck was accompanied by cherry puree. I couldn't resist a close up shot of the gorgeous herb / spice crust (menu says duck is roasted with rhubarb, shallots and scallions and served with broth with cured duck and watercress). Putting the elements of surprise and fun into a fine dining meal in a non-pretentious way - the next course came as one of 'self-discovery', in a mysterious picnic basket. Where the preceding courses were always presented with an introduction to the ingredients, preparation and/or inspiration behind the dish - this one was just listed as Fresh Cheese pretzel, parsley, and strawberries. And it simply arrived with just a hint of glee in my server's eyes, like a grownup who had just placed the first present in a child's hands Christmas morning, and couldn't wait to see the child's reaction when they've made their way to what's inside. Except, this adult considerately walked away and gave me space to explore and enjoy on my own. And it was indeed a treasure trove of everything you need for an indoor picnic, at the white-linened table of one of the finest restaurants in the country. The edible contents were delightfully creative - there was a chevre-style cow's milk cheese (a beautifully dense, spreadable yet structured and smooth consistency, minus the funk of actual goat cheese), honey and parsley spread in an adorable mason jar (I would have never thought to put the two together, but I couldn't stop eating), pickled unripe strawberries, fresh pretzel bread made with the pale wheat beer brewed exclusively for EMP (and they included the full bottle in the basket! I don't normally like beer - but this one was incredibly refreshing, well balanced and a perfect pairing for everything in the basket). This is hands down one of my favorite fine dining experiences of all time, because every element was so thoughtful and meticulously orchestrated. Every taste, every look and feel of every piece in the basket all worked in perfect harmony. I wish I could have ordered 10 of these to take home! For dessert, they had created a sorbet using the Whey from when they made the cheese for the picnic basket! Served with a smear of caramelized milk, and freeze dried milk foam that then crunches like the lightest shrimp chip! But, I think I liked the concept of this dish more than the taste - the textures were a little too thick and dense for me. And in another lovely tableside entertainment piece, the second dessert was an Almond Baked Alaska: I grew up loving these as a kid, that perfect and dramatic meeting of ice cream, cake, and mesmerizing show when blue flames lick the mountain / iceberg of meringue. Unfortunately these had gone out of fashion for a very long time, and were hard to find on restaurant menus. So it was exciting to see EMP doing their take on the 'classic' dessert. With almond cake and caramel ice cream. Again, optics matter, so they brought out the whole thing first, ladled rum over it, lit it on fire (though in daytime, it's harder to see the flames) - then took it back to the kitchen for 'cutting' and returned with this plate. Again, my chosen flavor, cherry, make an appearance here to add pops of color and sweet-tartness. By the end of this 3.5 hour lunch, and so many courses later (I'd lost count just about a quarter of the way through), the fresh mint tea helped soothe the over-satiated stomach. But this wasn't the end...there was still the Pretzel that was chocolate covered with sea salt, served with apple brandy (which serves as sort of a mnemonic to the delicious apples in the Waldorf salad). All you can drink, not kidding. They literally leave the bottle at your table. Too bad I'm a total lightweight - and can't handle that much liquer straight. But it was tasty. And, like any fantastic host, EMP left me with treats to take away - as a lovely reminder of the meal. In the box, was another Black and White cookie, but this time, subtly sweet with chocolate and mint. I also got a Ball jar filled with housemade granola! In a handy little shopping bag embossed with the symbols for the four flavors from which I made my selection at the beginning of the meal. A nice way to bookend the experience. Although it was a singular encounter, a very long lunch yet very brief moment at the same time, it was decidedly one of the most artful, cerebral yet very accessible meals I've had the pleasure of experiencing in the country, and one that I will remember, always. I was actually sad to have crossed this off the bucket list - and would relish the excitement of a return visit if I ever get another chance. Venice is a neighborhood that prides itself on creativity. So to keep things fresh, longstanding neighborhood staple Chaya features rotating menus focused on a key ingredient, for an entire month. There was the Venison fair. And now, this August: garlic, which surprisingly is their most popular theme ingredient. To kick off the evening, there were the garlic cocktails: Bacon Clove Jim Beam, bacon renderings, maple simpler syrup, muddled maple-marinated garlic clove, which was a bit too strong for me, and the Devilish Mary, a fun, light and surprisingly refreshing take on the bloody mary with Casamigos Blanco tequila, orange and lime marinated garlic, Chaya Bloody Mary mix, blood orange juice, and lime juice. Love the pickled clove and veggies for garnish as well. Then came the Bagna Cauda, a 'hot bath' of whole garlic cloves in olive oil, cooked to such a lovely tenderness that it spreads easily on the grilled bread. A creature made to pair with garlic, escargot had to be our next course. The double-down earthy dish was deliciously bold flavored and the snail was perfectly cooked for a robust, chewy consistency that is still juicy and soft. The Spicy Garlic Seafood "Tan Tan" Soup with garlic and miso-based broth, black noodle, calamari, shrimp, mussel and manila clam brought to mind a cioppino, but fused with asian flavors for an umami that made me want more as soon as I was done chugging the broth like it came in a shot glass. In another Asian-inspired dish, the Australia Wagyu Beef with Garlic Rice arrived in a bento box, with garlic and Korean BBQ marinade, over garlic kimchi rice. The Crispy Branzino was not the first choice at our table of more adventurous foodies, but as we wanted to have enough variety so that we can sample more of the entrees - I went for that safe, reliable branzino. Was so happy we did, as the fish was beautifully cooked, the meat so tender, flaky, juicy and flavorful it tasted like Cantonese style steamed fish - except with skillfully crisped skin on top that serves as nice contrast and highlights the texture of the fish below all the more. For the grand finale, we also had the 40-Clove Grilled Rib-eye with garlic au jus, roasted garlic, garlic mashed potatoes and broccoli. If you love garlic, and steak - this one's for you. All in all, everything on the menu we tried was tasty, and though you might not want to book a first date here unless you have some killer breath spray in your bag (and in fact the manager did joke at the start of the meal that they did prep some mouthwash in the restrooms!) - it's a great spot for friends or that 50th date with the person who is willing to demonstrate that they are really in it for the long haul, by sharing 40+ cloves of garlic with you. Love that this meal is good for you too (in foodie terms anyway! ): garlic is supposed to have antioxidant, antifiungal, antimicrobial etc. properties that are good for your immune system as well. After dinner, a bit of mint tea is definitely in order. Chaya also offers dessert in the form of a frozen cocktail popsicle (Spiked Frutas Popsicle) made with garlic and jalapeno infused Casamigos Reposado tequila, cucumber, watermelon, cantaloupe, fresh squeezed lime juice with Tajin seasoning. As a fan of a bit of heat in my drink, this kicked it up a notch in popsicle form so you get the 'fire and ice' on multiple levels. Creative way to cap a fun night out. The Garlic Fair just runs til the end of this month - catch it if you can. Garlic Fair drinks and exclusive dishes offered through August 31st, dinner only. Saturday and Sunday mornings are sacred. Usually for Ultimate Non-Morning People like yours truly, it's dedicated to catching up on sleep sorely missed during the hectic work week. But, some things are worth the sacrifice - mostly involving my favorite four letter words: food and free. Occasionally, I will make another exception for 'adventure'. 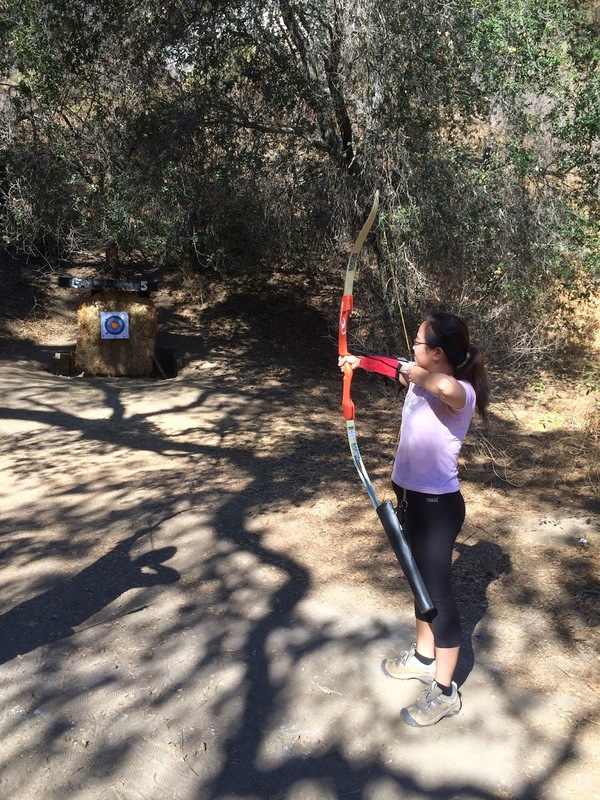 When I first heard about Pasadena Roving Archers (from a fellow diner at Petit Trois) - a volunteer group who offered lessons, including all equipment on loan, for free every Saturday morning, I thought it was too good to be true. Lessons start at 8:30am, but since it's free and space is limited, we heeded others' warnings to get there early - arriving at 7am to stand in line. Around 8am, they started processing people in small groups of about 7-8. First, we had to sign the requisite waivers. Then they test for participants' dominant eye before fitting us for equipment. Apparently, your 'dominant eye' is the one you use to aim - and that has no correlation to whether you are right or left handed. They test for this by having us hold our palms up and out, thumb and index fingers crossed to form a triangular 'hole', held up to our faces and looking through at the coordinator. The coordinator then calls out whether each of us are right or left eye dominant, and hands us a red or white casino-style chip accordingly. A bow that has the arrow rest etc. set up on the side that corresponds to your dominant eye, per your earlier test! A verbal overview is given so we knew what to expect from our time there. Apparently the Lower Arroya Seco Park range has 28 targets, set up 'like a golf course'. The PRA has spread their passion for the sport from this venue since 1935! For the beginner's session, team leaders take their small groups and stay at one station to teach and let us practice. We spent about an hour taking turns shooting in breakout groups. While at first some of us (ok, mostly me) were so off that arrows rebounded off the headboard - over time everyone improved with tips and adjustments from the instructor. I liked that you didn't need to be athletic to do this - it's more about form, and controlling your movements. Also, there is a lot of instinct involved as you can't really just aim the arrow straight at bulls eye - no matter what you do it's going to have a slightly curved trajectory, up, then down and over. So you just have to adjust, mainly lower than you'd expect, hold your bow arm steady while you pull the string back with the other, and gently let go - until you get it to land in the right area. And once you get it, repeat and try to be consistent. I felt like a kid on Christmas morning the first time I actually hit a color on the target board - there was something strangely satisfying about the combination of raw energy, alignment of every part of your body, the visceral connection with your bow, arrow and environment, and the feeling, motion and sound of the arrow cutting precisely and swiftly through the air to penetrate your target. The thing that I also absolutely loved about the experience with PRA - our instructor, like others in the group, a volunteer there just for the sheer love of the sport and desire to share his enthusiasm for it. In fact, his whole family is part of the club, and his daughter taught another small group at the station right next to ours! After our small group lesson, we were taken to the main range, where first we got to see what it feels like to shoot side by side with other archers from other groups. Of course there are safety measures in place - everyone stands at a chalk line, and no one is allowed to retrieve arrows until the whistle sounds three times! The instructors are also great sports about helping us take photos after the session was over. Once you've completed the early morning intro lesson - they hand you a certification card that allows you to come back at later times for other lessons / practice (at 9:30am on Saturdays) - donation encouraged of $5 which includes equipment on loan!! The Pasadena Roving Archers are a charity organization and do operate with donations only - so please be sure to contribute what you can into their collection box on the picnic tables afterwards! 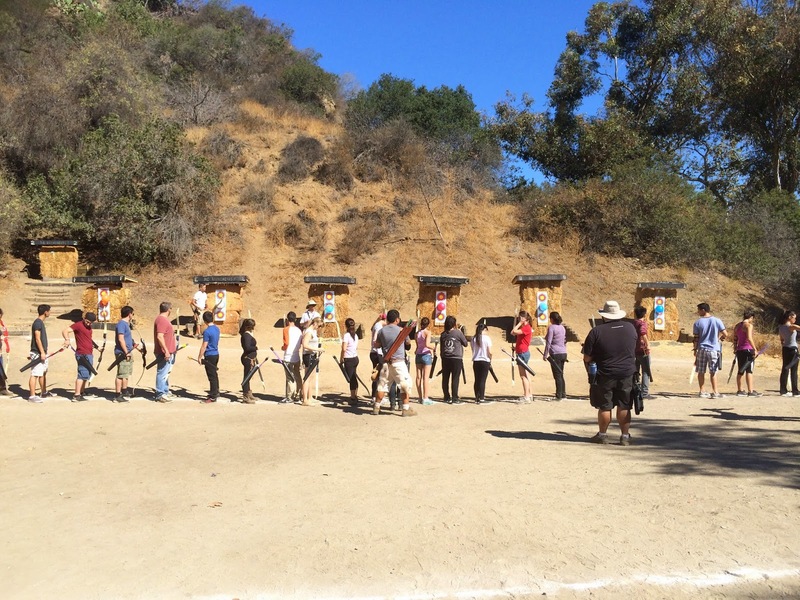 For those not willing to get up so early on a Saturday morning, even for this fun free activity - there are other companies / organizations around the city that offer archery classes at later start times, and sometimes at a cost. I haven't tried any of the other ones yet, but I can confirm that what other reviewers have said about PRA is definitely true - nothing beats learning from people who are just purely passionate about the sport and eager to share it with others. Thanks PRA for an amazing time - I'm adding you to my list of reasons to love LA - I'll definitely be back soon to practice!! Ever had a food that you literally dream about, and find yourself steering against that hypnotic voice on your GPS telling you to turn left, when your body knows better than to fight your cravings? I'd never even been a fan of chocolate cake at all - until I encountered chef John Park's incredible, aptly named 'Recklessly Chocolate' cake at a humble cafe in Koreatown. A modern, airy, unassuming space attached to a Korean supermarket (Assi) - where you might least expect the tastiest piece of chocolate cake you possibly may ever have in your life. The Recklessly Chocolate cake ($5) is made with a Guinness gel and chocolate glaze, which may only be partly responsible for the crazy addictiveness of this treat - it's also in the super light, yet flavor-packed chocolate mousse. And ultimately, I love that it's a single layer of (deliciously moist flavor bomb of) devil's food cake in between two layers of chocolate mousse, where most cakes would have the cake to mousse ratio the other way round. I knew I loved chef Park's ice cream, and now I'd developed an addiction to his chocolate cake, as well. Which unfortunately for this valley dweller is not sold at Quenelle in Burbank. But it's totally a 'destination' item for me and completely worth the drive - especially when you can have your pick of places to have fantastic dinner beforehand, in the area, as well. And, I've made it a 'rule of 3' every time I've been back to Brew/Well for that cake - all for me. So aside from the fantasmagoric cake, Brew/Well serves fresh brewed Art of Tea teas that I love any time of day. Daytime: iced teas like PJL ($5) passionfruit jasmine tea sweetened with honey and lychee puree, always hits the spot on a blazing summer day. The serenity of the spacious cafe, with tables as well as limited counter seating, is perfect for a nice afternoon of writing - if only I lived closer!